If you have been hugged by someone at work and felt uncomfortable, you may want to consult with a Los Angeles sexual harassment attorney to determine whether or not workplace hugging created a hostile work environment in your case. Call our offices at 310-527-6994. A workplace is not a family gathering where you can go about hugging everyone indiscriminately. In the wake of the #MeToo movement, invading your coworker, client, or subordinate’s personal space is a tricky business. 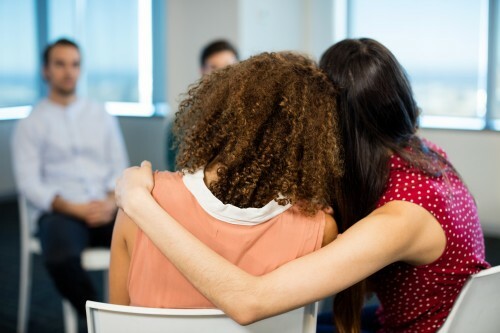 Many of our readers ask our Los Angeles hostile work environment attorney at Rager Offices Law, “When is it okay to hug a co-worker, client, or subordinate and when it isn’t?” What rules exist for hugs in the workplace? Even if your intentions are friendly and you are a sincere hugger, you could be accused of sexual harassment before you know it. Some of your coworkers, client or subordinate may misinterpret your intentions and think that your behavior is inappropriate simply because you decided to give someone a hug. Some people are so sick of being targets of sexual harassment in the workplace on a daily basis that they might even misconstrue a hug. Today, our experienced hostile work environment attorney in Los Angeles is going to explain when hugging someone in the workplace crosses the boundaries and amounts to sexual harassment. A man goes in for a hug with a female coworker but she clearly shows that she does not want physical contact with him. A boss walks into the office party and hugs one of his female employees. A manager walks into a meeting with his long-time clients. In what situation is it okay to hug? And when does hugging constitute unwanted sexual harassment? First and foremost, it goes against any basic rules for hugging in the workplace to hug someone who has made it clear that he or she does not want to hug you or is visibly uncomfortable or awkward returning the hug. Some people are awkward or uncomfortable when it comes to hugging any person regardless of the situation or the status of that person. It goes without saying that touching someone in the workplace inappropriately is a form of sexual harassment. And since hugging involves physical contact between two individuals, it is not surprising that many people think hugs are inappropriate at work. Needless to say, pressing too closely against someone in the workplace (which many people do when they give another person a hug, intentionally or not) can be misconstrued. And don’t get me started about whispering in someone else’s ear or wrapping your arms against a coworker’s waist. When does hugging create a hostile work environment? If you have been hugged by someone at work and felt uncomfortable, you may want to consult with a Los Angeles sexual harassment attorney to determine whether or not workplace hugging created a hostile work environment in your case. You are a female worker and the male hugger only hugs female employees, co-workers, or subordinates, but never males. You made it clear that you did not want to hug. The hug was accompanied by a kiss, whispering, inappropriate touching or any other sexual misconduct (optional). You have been hugged multiple times despite showing no interest in hugging or rejecting hugs. You have been hugged by your supervisor or employer (being hugged by someone in the supervisory position is taken more seriously than hugs by coworkers or clients). The hugger never asks permission before going in for a hug, does not give you a chance to reject the hug, or hugs you despite your continuous rejections. The hug is in any other way improper for the workplace. A rule of thumb is that in order for hugging to constitute sexual harassment it must be frequent and severe enough to create an offensive, abusive, or hostile work environment. Consult with our Los Angeles hostile work environment attorney from Rager Offices Law to find out whether or not hugging can be considered sexual harassment in your particular case. Call our offices at 310-527-6994 to get a free consultation.